Pardon me, but I’m about to get all interwebby for a moment. 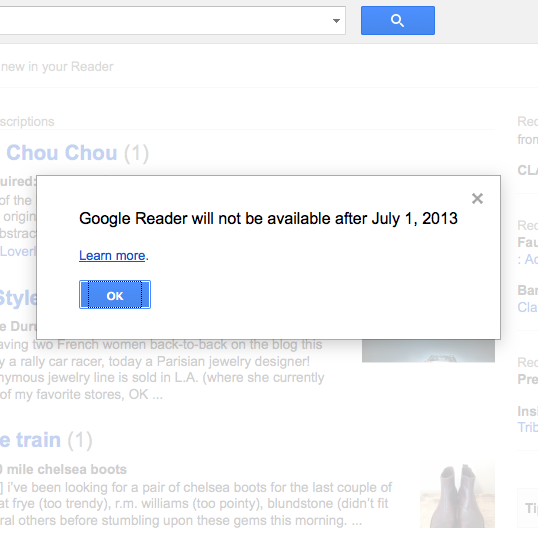 Last night, Google announced that they’ve decided to retire Google Reader on July 1, 2013, striking fear in the hearts of their smallish, yet loyal community of users (myself included). I started using the RSS feed organizer around the same time I started blogging, as an efficient and streamlined way to keep all the “stuff” I wanted to read in one place — news, blogs, etc. — and it totally changed the way I consume media online. But evidently, there weren’t enough of us Google Readers to keep the show going, so it’s being shuttered so that Google can concentrate greater efforts on fewer projects — one assumes the epic fail that is Google+ to be one such project, sigh. So what’s a girl to do, in order to wrangle the internets? It appears that consensus is leaning toward feedly as the next best alternative, and they’ve pledged that they will roll out a clone of Google Reader of their own, called Normandy, that is supposed to transition seamlessly to their back end after July 1 — all you need to do is import your Google Reader feeds before then. You can read more about Normandy and how to migrate here. I’m giving it a try, myself. Of course, if you have a reader to recommend, please pass it along! Aside from my own RSS crisis, I realized that some of you guys would be left in the lurch, too. I just wanted to mention that you can continue to keep up with my posts via the Quite Continental Facebook page, or via Bloglovin’ (which is like a mini RSS feed organizer for blogs), or you can sign up to receive my posts via email in that little subscribe box at the top right of my homepage. I also do my best to tweet my posts, but since it isn’t automatic that’s definitely subject to human error (and/or laziness and/or forgetfulness). and we can return to our regularly scheduled programming…. § 4 Responses to Et Tu, Google? Mariah, I’m so glad you posted this! I’ve been trying to adjust to the idea of being Google Reader-less and find an alternative. It’s nice to know I’m not the only one! Thank you soooo much for this post and reader recommendation, I’ve been kind of panicking since I got this frustrating little note in Google Reader yesterday. I’m now trying out feedly on all my devices and it syncs brilliantly, works great and looks a million times better than Google Reader. Ugh, I am so heartbroken! I love my Google Reader. I’ve been trying out The Old Reader but I have it and GR open and GR refreshes them much more efficiently. The Old Reader always showers fewer unread items than GR. So frustrating. I will have to give Feedly a shot. Thanks for the suggestion! I followed Quite Continental through Google Reader, but now I’m following on wordpress. Thanks for the alternative RSS organizers, Mariah. That Normandy option sounds like the busy girl’s solution! You are currently reading Et Tu, Google? at Quite Continental.